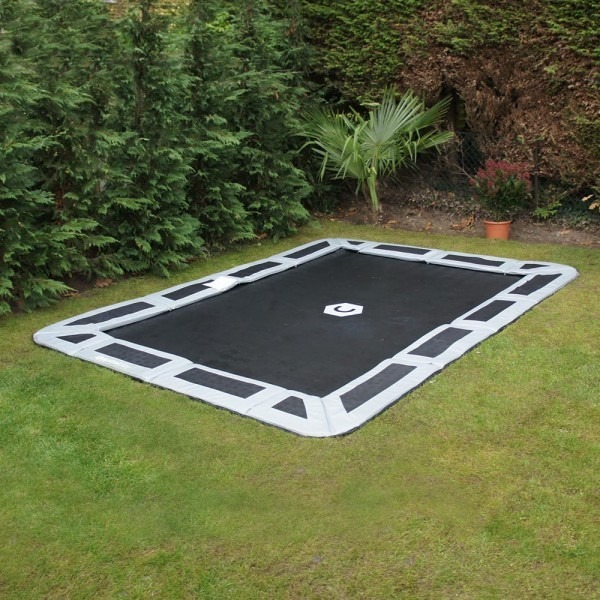 The 11′ x 8′ In-Ground Trampoline is a popular large size rectangle trampoline. This high quality in-ground trampoline kit comes with everything needed for easy DIY installation in your own back yard. The rectangular shape is great for fitting neatly into a corner with little wasted space. Easy to do – Our in-ground trampolines are designed to be easily installed yourself. Our website offers some great videos and tips for installation. Built to last – We’ve designed our trampoline and frame to be in the ground for a long time. With a combination of a heavy duty galvanised steel frame, longer commercial grade springs and Polypropylene Jump Mat you can be sure you’re getting a quality product that will last for years. Safer To Use – In-ground trampolines kits are safer than normal trampolines because they’re flush-to-the-ground not raised above the ground accessed by a ladder. Parents have peace of mind when they let their kids loose on an in-ground trampoline.